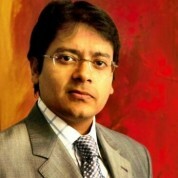 Lutfey Siddiqi is a Governor at the London School of Economics and an Adjunct Professor at the Risk Management Institute, National University of Singapore. He is also a member of the Global Agenda Council (Financing) at the World Economic Forum and a former board member of CFA Singapore. Until May 2016, he was a Managing Director and member of the global executive committee of FX, Rates & Credit (FRC) at UBS Investment bank with responsibility for emerging markets. He was also a member of the UBS Group Sustainability Council, the investment bank innovation board and the cross-divisional panel of opinion leaders. Lutfey obtained his First Class BSc. (hon) in Econometrics from the University of York, MSc. (Econ) from the London School of Economics and the International Baccalaureate diploma from UWC Atlantic College. He was honoured as a Young Global Leader by the World Economic Forum in 2012 and was invited to speak on the official program at Davos consecutively between 2013 and 2016. "I commend the Varkey GEMS Foundation for honoring the role of teachers and for encouraging the world to step forward with nominations of great teachers that have touched their lives. These stories in turn will inspire others in the profession and a virtuous cycle will have formed, multiplying their impact on children, present and future."